Club Soda has been successful in raising funds to launch a Croydon version of the highly successful Brighton based Gig Buddies scheme. The scheme benefits people with learning disabilities and/or autism, pairing someone who has a learning disability with a volunteer buddy, to become friends and go to events together. 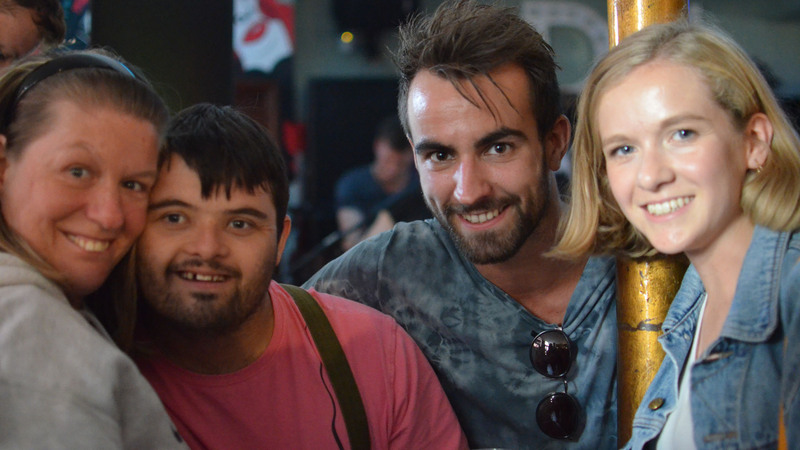 The Gig Buddies project makes volunteering easier, by enabling volunteers to go to gigs and other events that they might already be going to, but they would now go with someone with a learning disability. In 2016, Club Soda were chosen by the charity, Stay Up Late, who operate the original Gig Buddies scheme in Brighton, to become one of 10 national partners to launch their own local schemes across the UK. Club Soda will deliver Gig Buddies Croydon in partnership with Croydon Council’s Learning Disability Commissioning Team, who will help promote the use of person centred approaches by offering person centred training to all gig buddies. Gig Buddies in Croydon is aimed at adults with learning disabilities aged 18 years or over and who live at home with family, carers, or who live on their own and find it difficult to get out and about. Priority will go to people who get little or no funded support. We are officially launching Gig Buddies Croydon on 5 September at Boxpark where some of the Soda Crew DJs will be playing in the bar.